We, in the Nation of Islam, send our deepest condolences and sympathies to the family. But I want to say to Black America, that the same F.B.I. 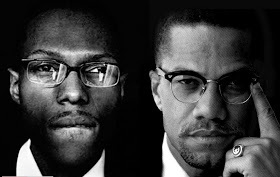 that hatched the plot to divide Brother Malcolm from his teacher and the Nation of Islam; that same F.B.I. that worked to destroy Black organizations and Black leadership—that same F.B.I. was dogging the footsteps of this young potential giant. Though he had a troublesome young life, he was growing more and more into the spirit of his grandfather as a warrior for justice of our people. A few months ago as he was on his way to Iran to attend a conference on Hollywood’s depicting Muslims as terrorists and planting the seed of hatred in the hearts of people all over the world for Muslims, he was arrested in the airport by the F.B.I. and not permitted to attend that conference. As we listened and read his remarks concerning his persecution, it seemed to me and to us that this young man was growing into a great helper of The Struggle of Black people in America, and oppressed people around the world. We really should look at the hypocrisy of a government that would place the picture of Brother Malcolm on a stamp, as though they really “admire” him, and there’s been a “change of heart,” and “now they love the man” that they once loved to hate. And then at the same time as his picture is on a stamp, they worked to destroy the only remaining male member to carry on his legacy and his name. The Time and What Must Be Done… Believe me: This criminal venture of the F.B.I., the same criminal forces that we, by The Grace of Allah, will expose on this broadcast; because it’s The Time, and it’s What Must Be Done—and we’ll be doing that, by The Grace of Allah, until this year’s subject matter is completed."